If my fourth grade teacher, Mrs. Reinhoff, was right, it looks to me that the Almighty Zeus was pissed off. 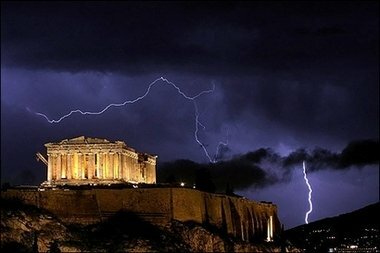 Stormy Acropolis : The ancient Greek Parthenon temple, atop the Acropolis hill overlooking Athens, is framed by lightning bolts during a thunderstorm that broke out in the Greek capital. What’s my point? Humor is everywhere. (Even in Greece.) Sometimes it’s just in your mind. Make it a habit to constantly search for stuff that tickles your funny bone, and you’ll live a better, happier, more humor-filled life. One technique you can use everyday? Think up alternate captions for interesting photos. They don’t have to be funny… (The Gods know mine wasn’t!) but just doing it helps you flex your humor muscle. PS. Now I gotta go write an apology to the King of the Gods. https://www.bradmontgomery.com/wp-content/uploads/2018/11/logo-1-495x198-1-300x120.png 0 0 admin https://www.bradmontgomery.com/wp-content/uploads/2018/11/logo-1-495x198-1-300x120.png admin2006-10-31 17:15:462016-11-02 08:31:15Greek God Humor? 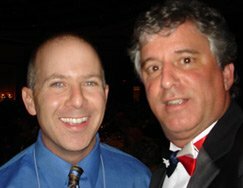 I did my motivational speakers thing at the AATH (American Association of Theraputic Humor) last year and met a very fun, very talented, and very authentic speaker: Texas’ own Dave Lieber. Dave makes his living as a full time columnist for the Texas Star-Telegram, but has been spending more and more of his time speaking to audiences across Texas and across the USA. He was good when I saw him, and he’s working hard. He’s well on his way. Why do I like him? Sure, he has good stories. And sure, he uses humor. But best of all, this speaker is totally authentic. What you see from the audience is the real deal; you really are seeing Dave. Besides, he’s what my Granny would call, “Good People.” He’s a nice guy, and I’m glad we’re friends. Peggy has a gift for making others feel great about being around her. When “average size” people greet Peggy, she has a gift for making them feel comfortable about her, comfortable about themselves, and is instantly able to get the conversation going. Part of her success in her ability to keep and maintain a positive attitude. She tells us that sometimes her life and differently-sized body has made it hard for her to keep a positive attitude. 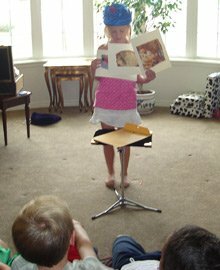 Learn more about Peggy O’Niell here. Learn about my work as a motivational humorist here. Yup, I’m a Colorado magician, and work all the time for corporate and association audiences performing my magician / comedian thing. But to be honest, nothing has made me so proud as watching my eldest daughter do some magic at a birthday party for her sister (my youngest kid). Claire did some killer magic, fooled the kids, and did herself proud. And yup, the hat was a nice touch. Need a corporate comedian magician? I’d love to be your guy. And if I’m booked? Call Claire. https://www.bradmontgomery.com/wp-content/uploads/2018/11/logo-1-495x198-1-300x120.png 0 0 admin https://www.bradmontgomery.com/wp-content/uploads/2018/11/logo-1-495x198-1-300x120.png admin2006-10-22 16:38:332016-11-09 01:30:05Need a Colorado Magician? Book my Kid! I’m in a mastermind group with other Colorado speakers. One of my “masters” is speaker Elaine Dumler. Elaine is a good friend, so it was cool to see her written up in the New York Times. Elaine Dumler is an expert at helping military families stay connected, even when one of the family members is away on deployment. She has a wonderful book (I’m Already Home), and this book is chocky jammed full of great ideas from her military families about specific ideas they use to stay connected. One of the ideas in the book is of the Flat Daddy. 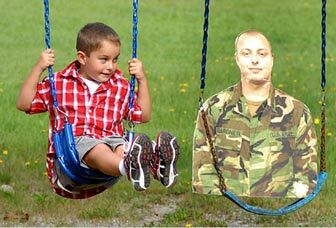 One military family uses a life-sized photo of their daddy around the house, at the dinner table, and even with the kids at play time, and this whole Flat Daddy concept is finally being picked up by the national press for the good idea that it is. More on the Flat Daddy Story here. 1. I’m psched for my speaker pal Elaine Dumler. It’s fun to see friends get recognition. 2. This Flat Daddy idea is not only great, it’s funny. Can you imagine taking family photos (at birthdays, at soccer practice, at school events) and having your Flat Daddy in the photo? Wouldn’t that help keep the tone at the next family event fun? Wouldn’t this type of humor be exactly what the doctor ordered? I love it! Way to Go Elaine! Way to go Flat Daddy! I’m just back from working with the Montana Guaranteed Student Loan Program of the State of Montana where they asked me to do my motivational humorist speaker thing and talk to them about bringing more humor to their workplace. It was a hoot. A total blast. First, it was amazing to see them come in not knowing what to expect of me or the retreat in general. Many of them were weary, guarded, and generally reserved. But as we laughed, joked and played through the morning and into the afternoon, they not only relaxed… but they got into it. It was really fun to see the arms uncross, the guarded look turn into smiles, and the quiet room turn into a loud party atmosphere. The transition was exciting to watch. It was also fun to see how may of the people already knew some (if not all) of what we were talking about. But even when we “know” something, we are not always doing it. And finally, it was very cool to help facilitate a list of actionable ideas that this group (and these individuals) could use to create, inspire and maintain a light, productive, humorous and positive workplace. Here are Brad’s Top Ideas for Leading the Way to Laughter at Work, with all of the specific ideas provided by the Montana Student Loan Folks. 6. Install (and use) a fart machine. 1. Have a crazy gift (like singing flowers) that you pass around to grumpy people. 3. Create a time of the day where everybody dances for 5 min. 4. Create a plastic turkey, and give it to the most upbeat person each day. 5. Play Through-the-day BINGO. (Perhaps over the intercom, perhaps one number every 10 min. If there is no intercom, just shout it over the cubicles! 6. Email jokes of the day. Have somebody in charge of this. -Have a bell on your desk and ring it when you successfully complete a task. -Create an Intra-Office Olympics. Chair races! -Have a single “bad” chair that you surreptitiously sneak to other peoples desk. -Use clown noses at work. Put them on when you’re in a bad team. -Have ST time. (This is a crazy time where the women (and the men I suppose) get together to do a quick 3 min touch up of their make up together. -Decorate the office for made-up, imaginary holidays. -Play a lot! Keep it up! Hey Montana! A favor? What was the ONE “Ah Ha” you got out of this seminar / keynote? What will you do differently based on our time together? Thanks Kids. It was a total blast. Need a humor in the workplace seminar or keynote for your organization? 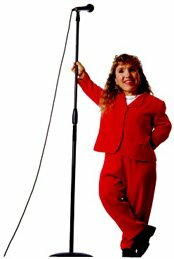 Need a Humorist Speaker? I mentioned that I did my motivational speakers thing in Missouri for the leadership team for Superior Essex. 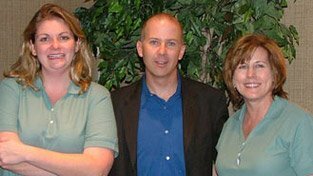 Here’s a fun photo of me with the two meeting planners, Beth and Debbie. I had a blast, kids! Thanks for making me part of the humor. https://www.bradmontgomery.com/wp-content/uploads/2018/11/logo-1-495x198-1-300x120.png 0 0 admin https://www.bradmontgomery.com/wp-content/uploads/2018/11/logo-1-495x198-1-300x120.png admin2006-10-17 10:58:432006-10-17 10:58:43This is Just in from Missouri! Or: What does A Clown Nose Have to Do with Happiness? Let me explain: I was recently doing my funny motivational speakers thing in Montana, and was totally (and wonderfully) blown away when a very kind, quite man approached me after the event. He told me he just wanted to say thanks. But there was something in this guy’s eyes that told me that he meant something different. And then he flattered me with some detail. It turns out that he had been through a string of very difficult events in his personal life recently, and his home life wasn’t much fun as it had been in the past. He told me that the difficult time in his past were, in effect, preventing some fun times in his future. He told me that my message about taking ourselves less seriously, and doing our best to play more (at work and at home) had touched him, and he knew that starting that day, things would be better. I reached into my bag and gave him a handful of clown noses to share with his family, and thanked him for taking the time to make MY day. Seriously…. I was blown away. Check out this photo Ben sent of his family — who according to him really needed a bit more laughter lately — enjoying themselves with those silly clown noses. I’m not postive what clown noses mean in the cosmic sense, but I think that for my Montana friend the noses are a symble of our need to laugh at ourselves a bit more. I’m convinced as a motivational speaker, I have the best job in the world. Not only do I get to travel; not only do I get to stand in front of audiences and make ’em laugh, but occasionally what I do actually helps people. According to my friend Ben, it helped him. All of this, and a check too. :) I’m a lucky man. I love my job. Thanks Ben. You made my day. https://www.bradmontgomery.com/wp-content/uploads/2018/11/logo-1-495x198-1-300x120.png 0 0 admin https://www.bradmontgomery.com/wp-content/uploads/2018/11/logo-1-495x198-1-300x120.png admin2006-10-15 10:58:142006-10-15 10:58:14Why is Being a Motivational Speaker the Best Job in the World? Hall of humor welcomes astronauts homeSeptember 25, 2006 — “Words with more letters than ‘Heidemarie Martha Stefanyshyn-Piper” reads one sign. “Have you seen me?” begins another, which is designed to resemble the back of a milk carton. 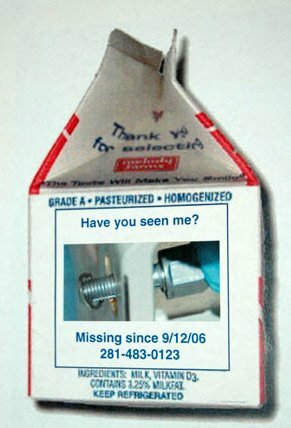 Underneath, is a photo of a fastener captioned as “Missing since 9/12/06”. 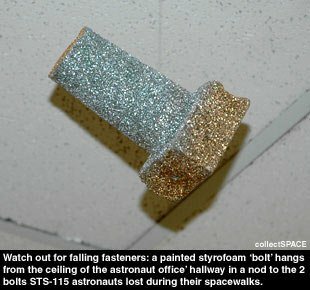 Perhaps they should look up: hanging overhead is a large piece of styrofoam painted and cut in the shape of a bolt. These and many more flyers, signs and decorations were awaiting the crew of space shuttle Atlantis as they came back to Johnson Space Center on Monday, their first day at work since landing from space on September 21. This ‘hallway of humor,’ courtesy of their trainers, leads between the parking lot and the astronauts’ offices inside JSC’s Building 4 South. It has become a custom for the returning astronauts to relive the funny moments — and perhaps embarrassing ones too — from their training and mission, hung in full view of all of their coworkers. Think Humor in the Workplace is important? You betcha! And these rocket scientists proved that it doesn’t take a bunch of money, a ton of time, or any special skills. Did they bring in a corporate comedian or motivational humorist speaker to do this for them? No…here is the genius: they just gave permission and encouraged this type of work culture and the rest followed. Need some humor in YOUR workplace? Check out my Humor in the Workplace keynotes and seminars here. https://www.bradmontgomery.com/wp-content/uploads/2018/11/logo-1-495x198-1-300x120.png 0 0 admin https://www.bradmontgomery.com/wp-content/uploads/2018/11/logo-1-495x198-1-300x120.png admin2006-10-13 01:34:082006-10-13 01:34:08Humor in Your Outer Space Workplace? What? !